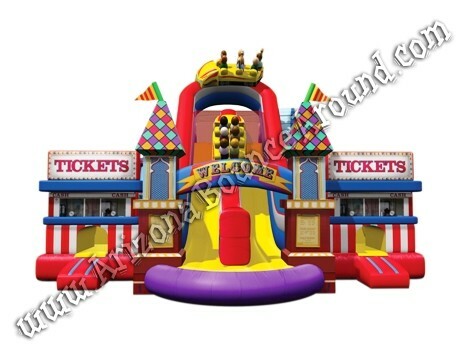 Rent our new Amusement Park Obstacle Course that will look like the entire Midway is at your party or event. This thrilling obstacle course captures all the fun and excitement of a real amusement park with 2 ticket booths, Roller Coasters, Ferris Wheel and Carousel Merry go Round all attached to this obstacle course. We also rent carnival rides for the ultimate carnival so be sure to check them out. Scroll down for more photos and video!!! Featuring eye-catching digital graphics all the way around, a long obstacle challenge, squeeze plays, climbing walls, and a dual lane 20' tall slide thats perfect for kids or adults. 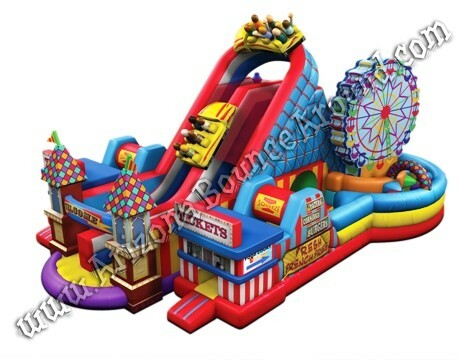 This Carnival Themed Amusement Park inflatable obstacle course looks amazng and features a 20' tall duel lane slide in the middle. You race through the 36' long obstacles, turn and climb the giant slide from behind then slide down to the end. Requires a 7kw generator to power the Amusement Park. 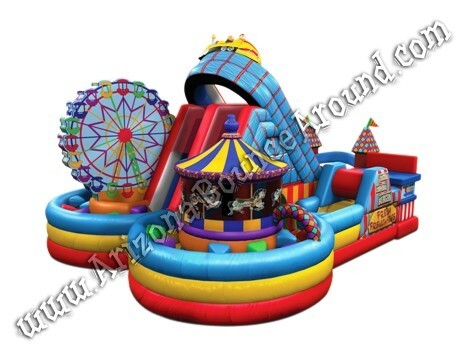 This Amusement Park inflatable obstacle course rental price includes standard set up. Standard setup is considered a real grass area that we can stake into the ground. Delivery and removal within included delivery area with no restrictions for delivery, set up or pickup. We do not set up this inflatable obstacle course on dirt or sand but it can be setup on asphalt, concrete or artificial grass by adding sand bags to your order. 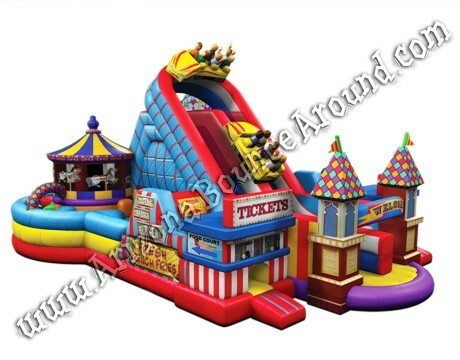 We rent carnival games, carnival rides and carnival booths to complete your carnival themed experience so call, click or come by today to have one of our party planners help plan your next event. We have a huge selection of obstacle courses, challenging games and activities for any type of event like our Wipeout Big Baller, Log rolling challenge and Zorb Ball race tracks so don’t delay and start planning your next team building activities today with Gravity Play Events, the leader in high energy games & fun activities for kids and adults of all ages. If you want to go even crazier than you can finish with our 51 foot tall Sky Scraper slide or freefall 28 feet down on our stunt jumping air bag.